The main difference between RDBMS and ORDBMS is that RDBMS is a DBMS based on the relational model while ORDBMS is a DBMS based on the relational model and object-oriented database model. Most enterprise applications use a DBMS to store and manage data efficiently. One common DBMS is RDBMS which stores data in tables. There is another DBMS called OODBMS. It allows applying object oriented programming for data management. ORDBMS has features of both RDBMS and OODBMS. Moreover, it fills the gap among the conceptual data modeling techniques such as entity relationship diagrams and object-relational mapping using classes and inheritance. RDBMS (Relational Database Mangement System) is a DBMS based on the relational model which was introduced by E.F. Codd in 1970. The model proposes 13 rules called Codd’s 12 rules to determine what quality a DBMS requires in order to become an RDBMS. RDBMS is one of the most popular DBMS around the world. This DBMS stores data in tables and these tables are connected to each other using constraints. These tables are also called relations. A table consists of rows and columns. Each row represents a record while a column represents an attribute. For example, in a University database, there can be separate tables to store records of students, lecturers, courses, exams, etc. The developer can use Structured Query Language (SQL) to perform operations on the RDBMS. He can also write SQL queries to insert data, edit data, and delete data. He can create tables, delete tables, and alter tables. Moreover, he can also write advanced queries to join multiple tables, create views and stored procedures. ORDBMS (Object Relational Database Mangement System) is an improved version that uses OODBMS ( Object-Oriented Database Mangement System). 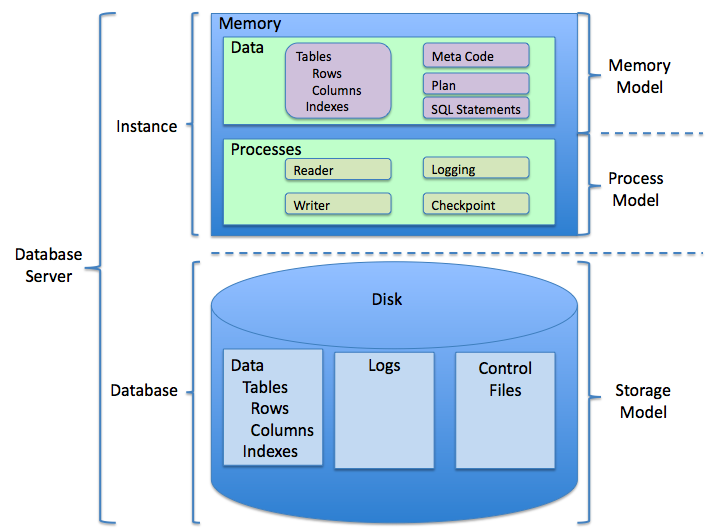 OODBMS is a DBMS that allows using OO programming language techniques in data management. While it improves performance and flexibility and reduces development costs in comparison to RDBMS, it has some disadvantages such as additional costs for computing resources, possibilities of design errors and data inconsistency. ORDBMS provides solutions to these issues. ORDBMS is a DBMS that is based on the relational model and the object-oriented database model. Therefore, we can consider an ORDBMS as an RDBMS as well. In other words, ORDBMS is used both as an RDBMS and an ORDBMS. It supports objects, classes, inheritance and provides a better interface to many OO languages. It also supports data model extensions with custom data types and methods. Companies such as Microsoft, Oracle and Sybase have released the object-relational versions of their products. It is more suitable for applications that process a large number of short lived transactions on data items that have a complex structure. RDBMS is a database management system based on the relational model of data while ORDBMS is a DBMS that is similar to RDBM but with an object-oriented database model. Thus, this is the main difference between RDBMS and ORDBMS. While RDBMS stands for Relational Database Management System, ORDBMS stands for Object Relational Database Management System. Another difference between RDBMS and ORDBMS is that RDBMS is based on Relational data model while ORDBMS is based on the Relational as well as Object Oriented database model. Furthermore, RDBMS is suitable for traditional application tasks such as data administration and processing while ORDBMS is suitable for applications with complex objects. Hence, this is also a difference between RDBMS and ORDBMS. MS SQL server, MySQL, SQLite, MariaDB are some examples of RDBMS while PostgreSQL is an ORDBMS. RDBMS and ORDBMS are database management systems. 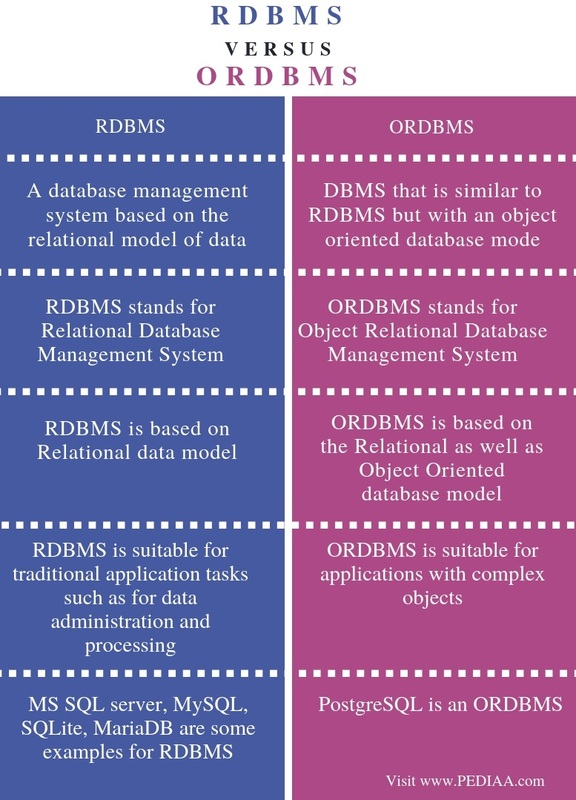 The main difference between RDBMS and ORDBMS is that RDBMS is DBMS based on the Relational model while ORDBMS is a DBMS based on the Relational model and object-oriented database model. In brief, ORDBMS is an extended version of RDBMS. 1.“Relational Database Management System.” Wikipedia, Wikimedia Foundation, 26 Mar. 2019, Available here. 2.“Object-Relational Database.” Wikipedia, Wikimedia Foundation, 8 July 2018, Available here. 3.“What Is Object-Relational Database Management System (ORDBMS)? – Definition from Techopedia.” Techopedia.com, Available here. 4.Mahara, Dabbal Singh. “Ordbms.” LinkedIn SlideShare, 15 May 2018, Available here.